Can the words “mom” and “clean house” coexist? As a mom of 8, I certainly understand that at times these words can be like oil and water. Having a clean home means less overwhelm, less stress, and even less depression in some cases. But when it comes to cleaning tips, some just aren’t realistic when life is busy. The truth is, being a mom and tending to the needs of our kids is a ton of work. Added to that is the fact that we are often homemakers, working women whether in the home our outside of the home, volunteers within our community, caring for aging parents or others, and so much more. With all of these demands on our time, it can be so difficult to work on keeping our homes clean as well. Looking for some quick ideas on cleaning ideas, tips, and tricks? Spring cleaning is right around the corner. 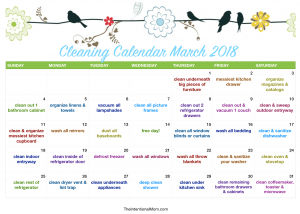 Enter your email below to receive our cleaning calendar of what to clean in March with a new simple cleaning task each of the 31 days of the month! The words I have to share here are spoken from the heart of a mom whose oldest child is a sophomore in high school at the time of this writing. This means that in as little as three years, I could have kids who are leaving the nest. This is certainly a startling reality at times. The things I’m going to share today are things that I wouldn’t have come up with even five years ago. There is something about watching the sun set on my oldest child’s years of living in my home that makes me see things a bit differently. But yes, I still do like a clean home. And at times, this can complicate things. Spring cleaning is right around the corner, but it can be hard to come up with a spring cleaning schedule, especially for busy or working moms. While it is also true that kids can learn to follow rules, kids can learn to be tidy, kids can learn to take pride in their work, and kids learn to be careful, living with kids means that things just take a beating. This is especially true in my home since there are 10 people all living under the same roof, which means there is just a ton of traffic in all areas of the house at all times as we also homeschool. Living with kids also means that cleaning takes work. More work, different work, constant work, and everything in between. So then, let’s explore the busy (and realistic) mom’s guide to a clean home. I think this is something that I as a young mom refused to recognize. I hung on to my life without kids ideals when it came to a clean house much longer than I wish I would have. Clean is just different. Period. In order to keep your home clean by your standards, you need to establish what those standards are. Don’t simply accept someone else’s standards as your own. You are different from someone else, and so is your family, your home, your season, and your circumstances just for starters. This is another one of those things that I held on to for too long. Spoken from a mom whose kids are starting to flee and each moment is even more precious than before, a clean home should take a backseat to living life. Am I saying that your home shouldn’t be clean to some extent and by your definition? No, I’m not. But please, put your family first. If everyone lives there, everyone should take part in keeping it clean, even young kids. This week in my newsletter I’ll be sharing a chore list by age as it works in our home. Be sure to subscribe by filling in your email address in the bar at the very top of my site so you can get it. But, the point is that everyone should help, and that everyone will do a better job at keeping the house clean if they have a vested interest in it – and if they know that they will be the ones cleaning it up in the end! 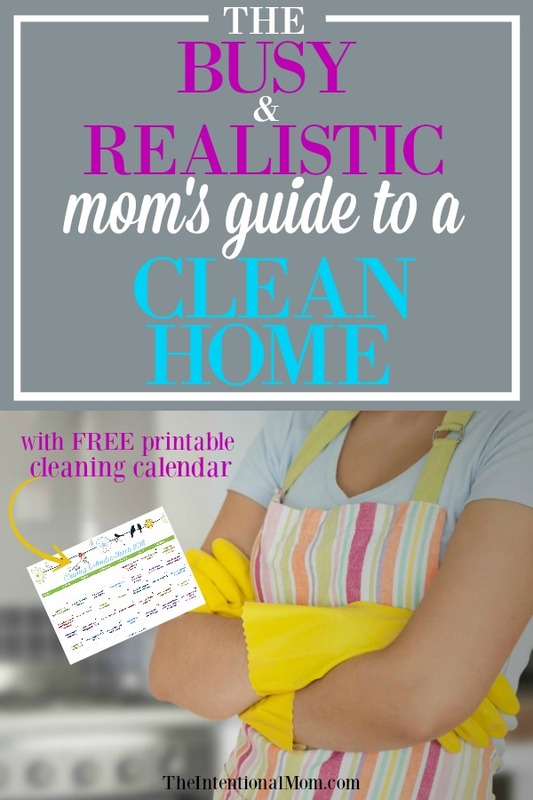 Be sure to click on this free printable cleaning calendar below to receive instant access! You can check out It’s Cleaning Day, Tips and Tricks For Cleaning With a Family, and The One Hour Cleaning Checklist for some inspiration, but develop a cleaning schedule and systems that work for you. Adopt wisdom you get from others by all means, but make you have systems and schedules that work for you. This is one of those things that I think is a good thing for nearly everyone. One of the best things I do is a 10 Minute Tidy. Go read it…it’s really awesome and has been a life saver in my life. When you are filling your home with things that haven’t cost you a small fortune, you are much better able to remain calm when these things get ruined. Remember how I shared what my friend and I talked about in the very beginning of this post? Having kids means some of your stuff will get ruined. When you’ve planned for it by filling your home with things that are used, distressed, and simply practical rather than beautiful as your primary criteria, it’s not nearly as painful when something bad happens. When you have less, there is less to have a mess, less to clean, less to break, less to worry about, less to stress about, less to watch over like a hawk, and less to cry about when it shatters into a million pieces. When it comes to kids and a clean home, less is truly more. Ask me about this one. I have a four month old who fusses all night long. She has reflux issues that flair at night, and I am getting way less sleep than I should. This is a season that limits me, which means that my standards and expectations of clean must adjust to account for this. It is important to work towards having a clean home, but it is also important to be realistic about what this means. If you are a busy mom, keep this guide in mind…you deserve it!